Ah, Torian. Issen’s future love interest… I couldn’t wait to meet him (well… I could). First time Issen1 sees him, he’s hanging around other mandalorians and sucking up to her awesomeness. 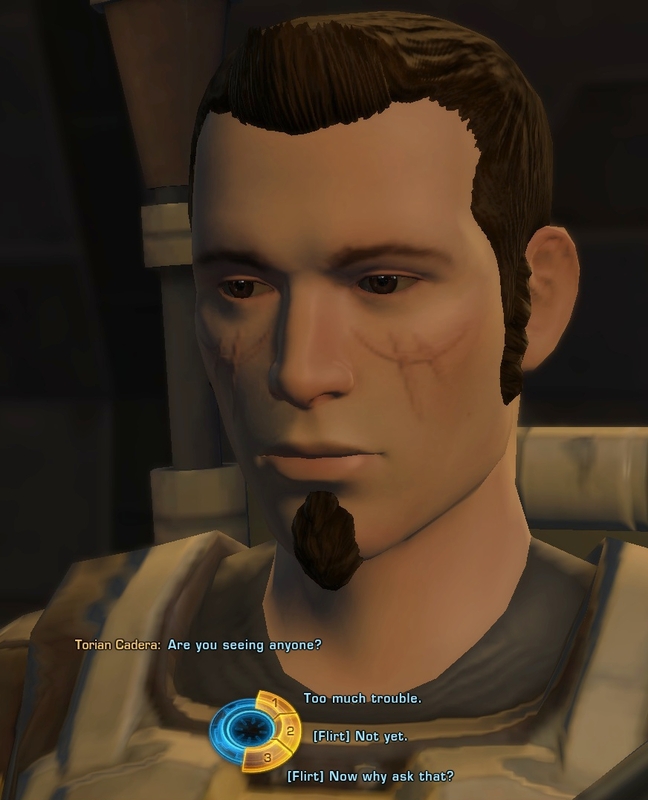 He sounds considerably less awesome than the other mandalorian companion, Akaavi Spar… and much less manly. Not sure if that’s a comment on him or Akaavi. I call him “kid”. This doesn’t bode well, considering yes, he looks like a kid, but Issen looks like she’s 12 too. OK, how could I not pick this one? Issen goes on about how she just wanted to see him again, he gets all flustered like OH HEY REALLY?… and then Issen takes his pistol, knocks him down, puts a boot on his chest, a gun to his head, and makes a disparaging comment about men being stupid. Mako laughs at him. I mean seriously… I expected him to break out in song. 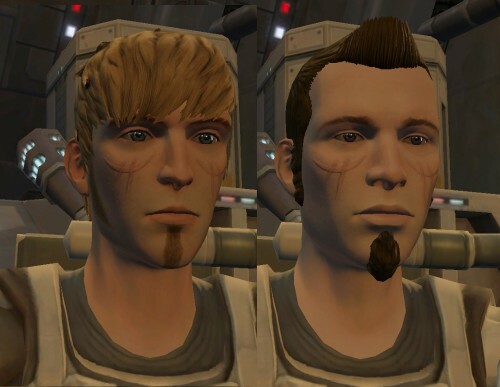 The other choices, by the way, were mostly abysmal with mohawks and other such nonsense. I picked every damn flirt option there was, and Bounty Hunters aren’t exactly subtle. He basically ignored it. Like he didn’t even acknowledge the blatant throwing-self-at-him by even looking eager or embarrassed. From his non-reaction, Issen might as well have said “I like snacks” or “guns are nice”. A far cry from his previous schoolboy crush that allowed Issen to disarm him. So Issen tried giving him courting gifts. Nope. The big +0 of Disgust. Great, so now Issen looks like this sexually harassing cougar while poor, innocent, young Torian is desperately trying to disregard her really blatant advances. You know, all the other NPC’s were totally PSYCHED when Issen flirted with them. There was even a BSOCK! What’s wrong with this Torian kid? (Spoiler: It’s not like I offed his father – he did that himself. ) Things were getting pretty awkward around the D5-Mantis. 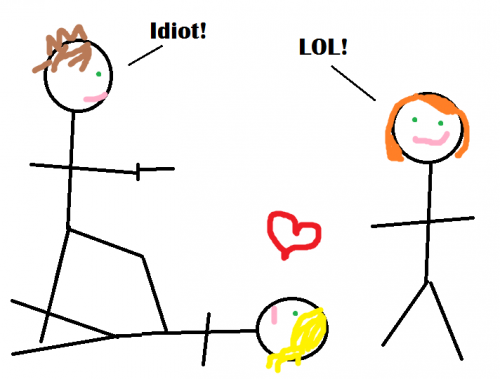 So, sigh, since he didn’t want courting gifts – fine! Apparently a way to a man’s heart is through guns and ammo. I learned that from Corso and Cat Bauer. A few trips to the military surplus store later, he’s asking if Issen is single. Har har. I hope his idea of a hot date doesn’t involve slogging through the forest to kill some disgusting beast. FINALLY! Now I can get rid of some of those craptastic courting gifts… er I mean… woo Issen’s sweetie. It’s just a matter of time. 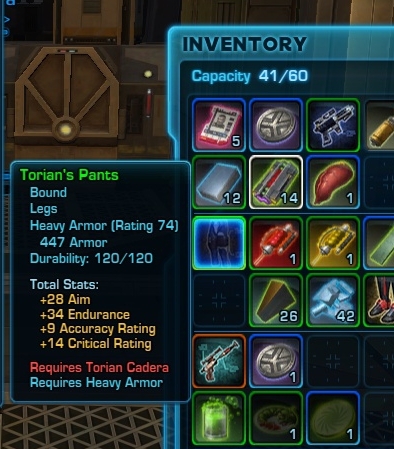 Issen already has his pants in her inventory. 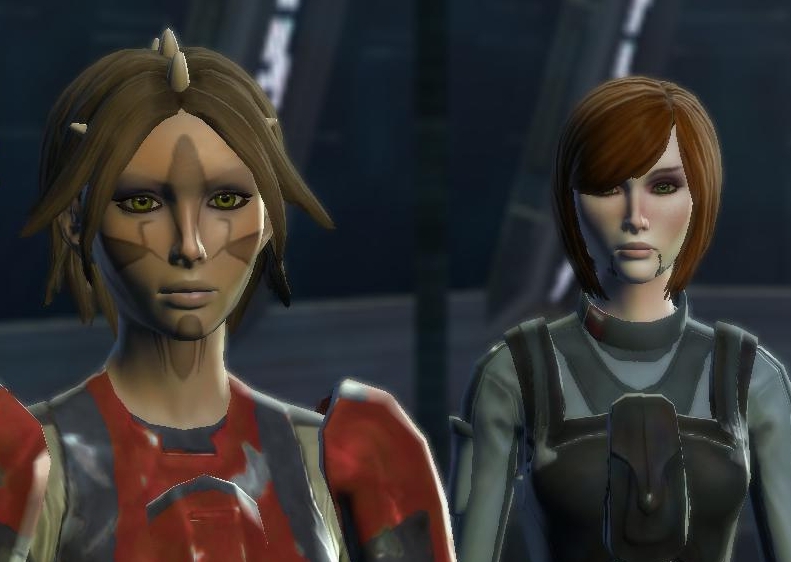 I made a few Bieber jokes myself when my co-blogger picked up Torian for her crew. Surprising that he wasn’t responding to flirts though! Most companions are quick to jump on that. You say like two nice words and they’re like “hey does that mean you want to marry me? !” I wish there were more let them down gently options. I get attached and don’t want to hurt their feelings. I just don’t always want in their pants. Anyway… I”m glad you figured out that Torian was way more into guns and ammo than courting gifts. At least initially. I assume he likes them now? I hate ending up with this huge stockpile of courting gifts and no one to give them to. Though if I recall correctly one of my inquisitor companions liked them despite being completely un-romanceable by either gender. So that was a good way to unload them at the time. Also wanted to say that the evil twin idea is really neat! And Issen’s facial markings manage to mimic a goatee esque shape on the chin so it works.! The evil twin thing is very fun when you’re going through the same story twice. One of my guildies had a main who was a pure-good-sage. So when he wanted to roll a shadow, he made an “evil twin” and did the whole story evil. Some people who started out evil had to make a “good twin”. Well apparently when I tried to flirt with him, he wasn’t in romance mode. I think it was a gender-neutral conversation he has with all the bounty hunters, including boys, about hunting and mandalore and other such nonsense – and there were so flirt OPTIONS for the girls, but no flirt REACTIONS from him. So the “romance” wasn’t initiated until he started asking Issen whether she had a boyfriend. Now, yes, he will accept courting gifts, although he likes trophies better. When I give him a courting gift he says, you guessed it, “Thanks”, and that is it. Damn tall, dark (now), and stupid. This just in, sometimes men are thick in the head and don’t notice when the womenfolk start flirting with us. In other news, the sky is blue.